Spicy cool lunch on a hot summer day. Cut crosses on both ends of tomatoes and place them in hot water for a minute. De-skin and de-seed the tomatoes. Cut into smaller pieces. Peel and cut the cucumber, if it has big seeds, cut them out too. Cut the celery into small pieces. Finely chop the onion and garlic if you are using the fresh garlic. Purée everything in a food processor, blender or with a mixer. Add salt, chilli powder and olive oil and mix. Taste. Finetune if need anything else. Let it cool down, then press the fish into a mass with a fork. In a bowl, preferably with high sides, mix the fish with mascarpone, season with salt and pepper. Using the mixer mix for a minute till the mass becomes lighter and fluffier. Add fresh cream and mix for 1 minute. Serve the soup with the salmon mousse and garnish with chopped fresh parsley. Drizzle a few drops of extra virgin olive oil. Eat with toast bread or make crisp bread in the oven from thinly slices bread, drizzle a little olive oil on the bread and cook in the overn of 190C for 10 minutes till crisp. 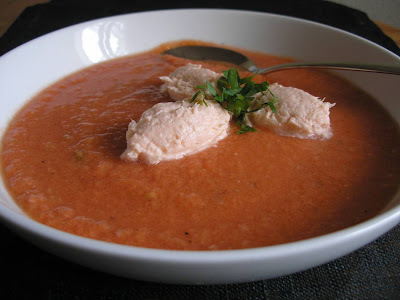 The idea of combining tomato soup with salmon arose from me misunderstanding a menu and I thank Margus, a cooking aficionado in Estonia, for that.